This morning we checked out of our hotel, stopped for church in a suburb of Cleveland, and then drove home. Thankfully the Easter bunny found the baskets, filled them, and left them where the kids could find them. Some little person was worried he wouldn't get anything. After we got home I threw a ham in the oven and rested for a bit. 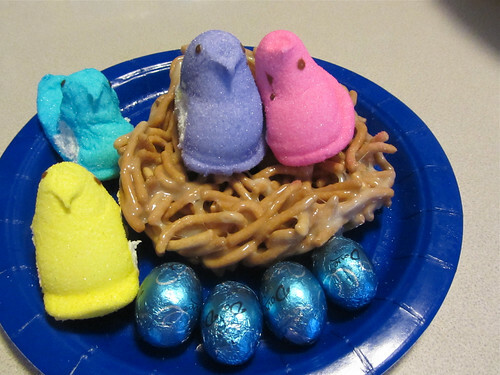 Per Mat's request we made Peep nests again. We had a very laid back family and yummy dinner.